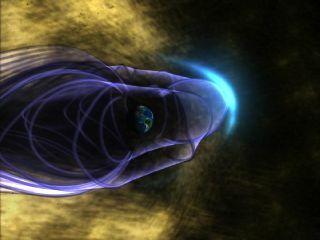 This is an artist's concept of the Earth's global magnetic field, with the bow shock. Earth is in the middle of the image, surrounded by its magnetic field, represented by purple lines. The bow shock is the blue crescent on the right. Many energetic particles in the solar wind, represented in gold, are deflected by Earth's magnetic "shield". The solar wind streams plasma and particles from the sun out into space. Though the wind is constant, its properties aren't. What causes this stream, and how does it affect the Earth? The corona, the sun's outer layer, reaches temperatures of up to 2 million degrees Fahrenheit (1.1 million degrees Celsius). At this level, the sun's gravity can't hold on to the rapidly moving particles, and they stream away from the star. The sun's activity shifts over the course of its 11-year cycle, with sun spot numbers, radiation levels, and ejected material changing over time. These alterations affect the properties of the solar wind, including its magnetic field, velocity, temperature and density. The wind also differs based on where on the sun it comes from and how quickly that portion is rotating. The velocity of the solar wind is higher over coronal holes, reaching speeds of up to 500 miles (800 kilometers) per second. The temperature and density over coronal holesare low, and the magnetic field is weak, so the field lines are open to space. These holes occur at the poles and low latitudes, reaching their largest when activity on the sun is at its minimum. Temperatures in the fast wind can reach up to 1 million F (800,000 C). At the coronal streamer belt around the equator, the solar wind travels more slowly, at around 200 miles (300 km) per second. Temperatures in the slow wind reach up to 2.9 million F (1.6 million C). The sun and its atmosphere are made up of plasma, a mix of positively and negatively charged particles at extremely high temperatures. But as the material leaves the sun, carried by solar wind, it becomes more gas-like. "As you go farther from the sun, the magnetic field strength drops faster than the pressure of the material does," Craig DeForest, a solar physicist at the Southwest Research Institute (SwRI) in Boulder, Colorado, said in a statement. "Eventually, the material starts to act more like a gas, and less like a magnetically structured plasma." As the wind travels off the sun, it carries charged particles and magnetic clouds. Emitted in all directions, some of the solar wind is constantly buffeting our planet, with interesting effects. If the material carried by the solar wind reached a planet's surface, its radiation would do severe damage to any life that might exist. Earth's magnetic field serves as a shield, redirecting the material around the planet so that it streams beyond it. The force of the wind stretches out the magnetic field so that it is smooshed inward on the sun-side and stretched out on the night side. "Solar ejections are the most powerful drivers of the sun-Earth connection," NASA says on its website for the Solar Terrestrial Relations Observatory (STEREO). "Despite their importance, scientists don't fully understand the origin and evolution of CMEs, nor their structure or extent in interplanetary space." The STEREO mission hopes to change that. Though some bodies are shielded by a magnetic field, others lack their protection. Earth's moon has nothing to protect it, so takes the full brunt. Mercury, the closest planet, has a magnetic field that shields it from the regular standard wind, but it takes the full force of more powerful outbursts such as CMEs. When the high- and low-speed streams interact with one another, they create dense regions known as co-rotating interaction regions (CIRs) that trigger geomagnetic storms when they interact with Earth's atmosphere. The solar wind and the charged particles it carries can affect Earth's satellites and Global Positioning Systems (GPS). Powerful bursts can damage satellites, or can push GPS signals to be off by tens of meters. The solar wind ruffles all of the planets in the solar system. NASA's New Horizons mission continued to detect it as it traveled between Uranus and Pluto. "Speed and density average together as the solar wind moves out," Heather Elliott, a space scientist at SwRI in San Antonio, Texas, said in a statement. "But the wind is still being heated by compression as it travels, so you can see evidence of the sun's rotation pattern in the temperature even in the outer solar system. We've known about the solar wind since the 1950s, but despite its extensive effects on Earth and on astronauts, scientists still don't know how the it evolves. Several missions over the last few decades have sought to explain this mystery. Launched on Oct. 6, 1990, NASA's Ulysses mission studied the sun at various latitudes. It measured the various properties of the solar wind over the course of more than a dozen years. The Advanced Composition Explorer (ACE) satellite orbits at one of the special points between Earth and the sun known as the Lagrange point. In this area, gravity from the sun and the planet pull equally, keeping the satellite in a stable orbit. Launched in 1997, ACE measures the solar wind and provides real-time measurements of the constant flow of particles. NASA's twin spacecraft, STEREO-A and STEREO-B study the sun's edge to see how the solar wind is born. Launched in October 2006, STEREO has provided "a unique and revolutionary view of the sun-Earth system," according to NASA. A new mission hopes to shine light on the sun and its solar wind. NASA's Parker Solar Probe, planned to launch in the summer of 2018, aims to "touch the sun." After several years of closely orbiting the star, the probe will dip into the corona for the first time, using a combination of imaging and measurements to revolutionize understanding of the corona and increase understanding of the origin and evolution of the solar wind. "Parker Solar Probe is going to answer questions about solar physics that we've puzzled over for more than six decades," Parker Solar Probe Project scientist Nicola Fox of the Johns Hopkins University Applied Physics Laboratory, said in a statement. "It's a spacecraft loaded with technological breakthroughs that will solve many of the largest mysteries about our star, including finding out why the sun's corona is so much hotter than its surface."